Jhana meditation, sometimes referred to as samatha meditation, is a concentration practice in which one moves through various mind states, called "jhanas," in a progression that leads to deeper and deeper absorption. 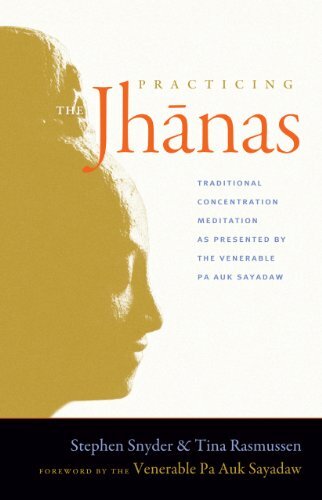 The jhana states are sometimes referred to as "meditative absorptions," or simply "absorptions." This practice is notoriously esoteric and difficult to understand for the lay practitioner. Jhana meditation is the practice associated with "Right Concentration," which is the eighth branch of the traditional Buddhist Eightfold Noble Path. The initial instructions for Jhana meditation are fairly straightforward. After taking a traditional meditation posture, one chooses an object of concentration, often times the feeling of the breath flowing over the upper lip. When the attention wanders away, the meditator simply brings it back to the object of concentration – in this case the sensation of the breath. One simply repeats this procedure, focusing the attention on the feeling of the breath on the upper lip, over and over again, reaching deeper levels of concentration. In this process, the jhana states are said to arise. sukha: bliss, or a more refined state of happiness than piti – sometimes thought of as "gentle contentment"
First Jhana: All jhana factors are present. This is described as an excited and pleasant state. Piti is said to be the primary marker of this state. Second Jhana: Piti, sukha, and ekaggata are present. Sukha is said to be more prevalent than piti in the second jhana, and the experience begins to calm. Third Jhana: Sukha and ekaggata are present. Piti disappears and this jhana is marked by a calm contentment. Fourth Jhana: Ekaggata and upekkha are present. Emotion disappears altogether and the mind is one-pointed and calm. The jhanas are said to be successive and one must "master" each jhana (holding the state continuously, sometimes for several hours) before moving on to the next. In one sitting, the meditator has to enter the lower jhanas before reaching higher levels (i.e. you have to enter first jhana, then second jhana, to get to third jhana). As one continues their practice, they are said to have the ability to move through each state more quickly. After a meditator has achieved the first four jhanas, they are sometimes led through a complex series of sequences in which they move through the first four jhanas using the breath as the object of meditation and then switch the object of meditation to certain elements of the body (there are 32 unique body parts that one must progress through) or kasinas (mental images of colored disks). After completing this complex series of meditations, the meditator is ready to experience Jhanas 5-8, the "Immaterial Jhanas." The jhana states are not always described in the same way which leads to a lot of confusion in this practice. It is also not always easy for the meditator to recognize the jhana factors or what state they are in (i.e. "Am I experiencing piti or sukha? ", etc.). Even more so than in other practices, the specific instructions for jhana meditation will differ based on the teacher. If a meditator is interested in this practice, they will likely need to seek our a teacher who is certified in a particular lineage.